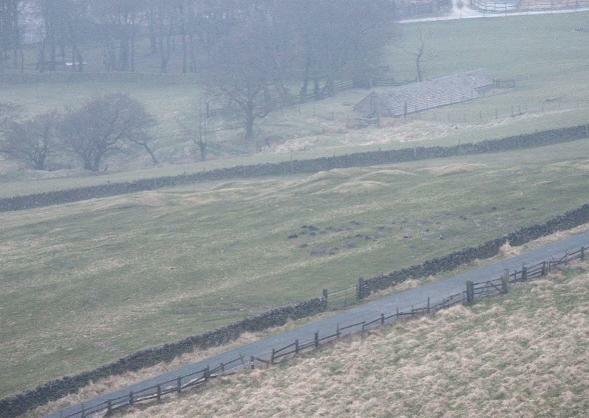 Promontory hill fort (SK 055784) 1.5 miles SW of Chapel-en-le-Frith. 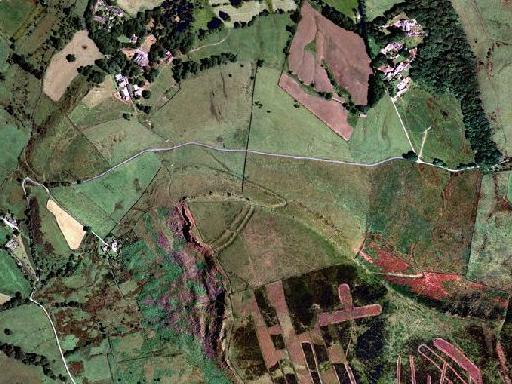 Castle Naze must be one of the most extraordinary hill forts in Derbyshire. This is due to its ditched entrances, of which two are visible. 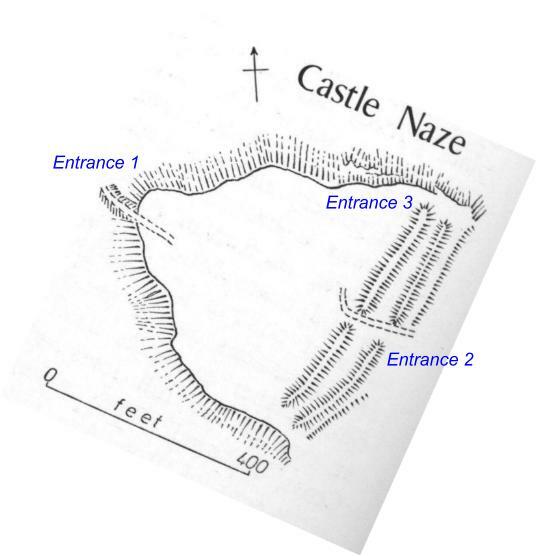 Castle Naze. The Causeway to entrance 1 can be seen circling the right side of the hill. 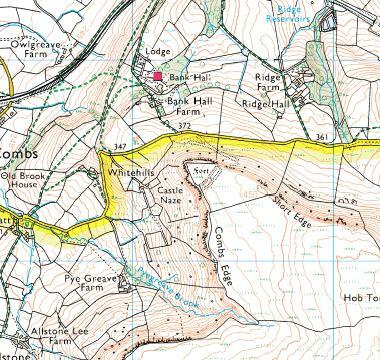 OS Map with Castle Naze in the center, the outworks which are called “Ditch Entrance 3” in the text are also shown to the north east. “This fort occupies a triangular area of c. 2.5 acres. 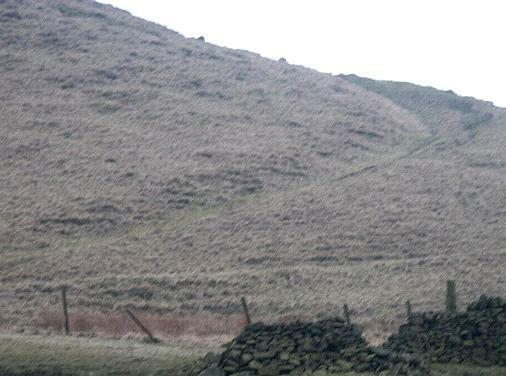 The N and S sides are protected by natural slopes. The E side is protected by 2 banks with a ditch beyond the outer. Excavation has shown that the inner bank is the earlier and is of dump construction. Traces of a dry stone facing to the outer bank were found: this is the larger earthwork, dominating the inner. The entrance through the middle is probably not the original. Access seems to have been gained through the gap between the N ends of the earthworks and the cliff edge, approached today by a prominent hollow way up to the hillside. Not dated but probably late Iron Age.” Guide to Prehistoric England, Nicholas Thomas, 1960. 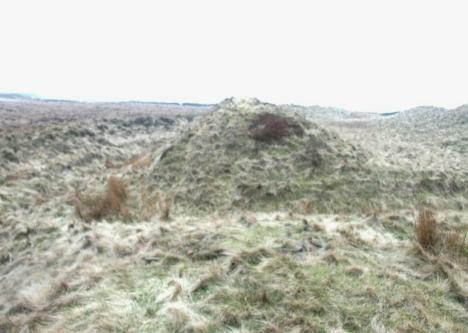 This is a promontory fort of probable Iron Age date. It uses the natural cliffs of the hill that it stands to protect its northern and western sides. It is triangular in form, and in order to protect its south eastern face, a very impressive double rampart of possibly later Iron Age construction has been thrown up. 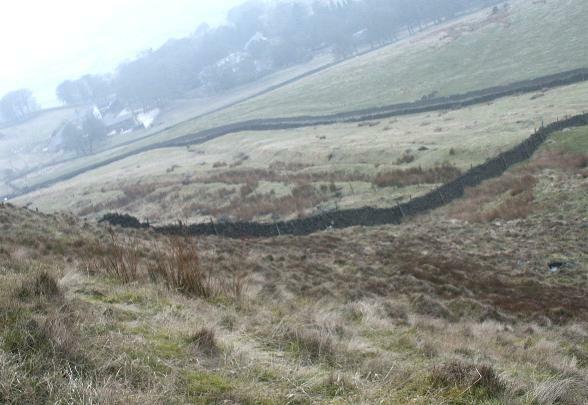 The rampart has a wide outer ditch, which is c. 1-2m deep and 2-3m wide. Behind this is a rampart, probably of dump construction faced with dry stone walling, this is 3-5m high, and perhaps 5m wide. Behind this is an un-ditched gap of perhaps 20m to the inner rampart, which stands approx 3m high. The inner rampart, viewed from within the enclosure. Another view of the inner rampart. The outer rampart and ditch. The gap between the inner and outer rampart. 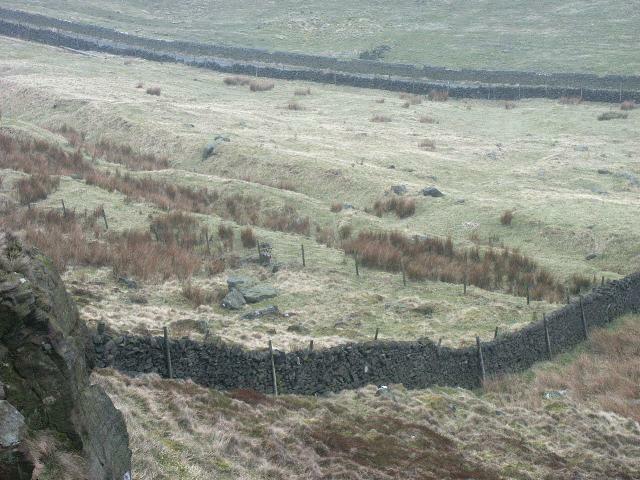 Possible dry stone wall facing for the outer rampart, other areas not inspected. Above: Multimap air photo of Castle Naze, the double rampart can be seen in the lower center. The ditched entrances can also be seen. 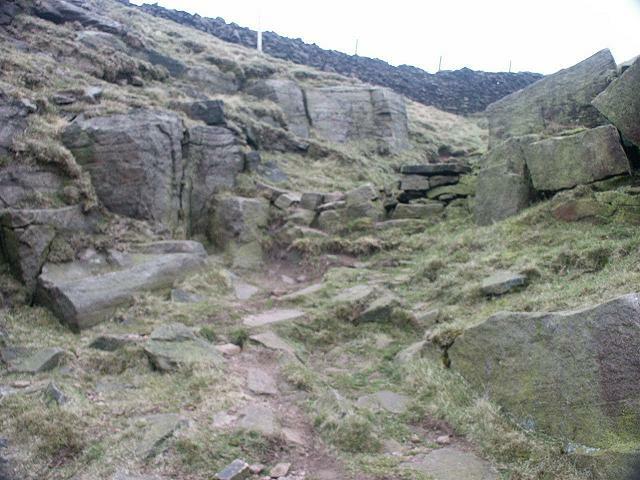 The first entrance is a well worn causeway which travels to the North western tip of the fort from the northern side. 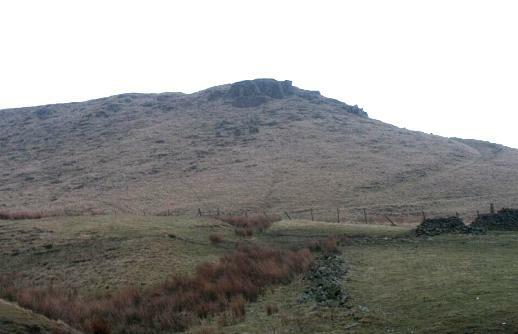 It can be seen in the above picture, and also in the photo of Castle Naze at the top of the page. 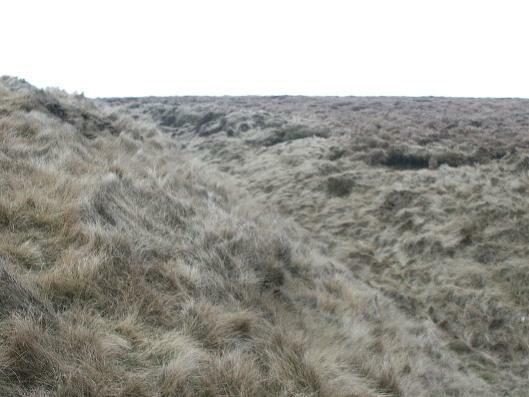 It appears as an evenly worn furrow which becomes dissolved as it reaches the summit of the fort. 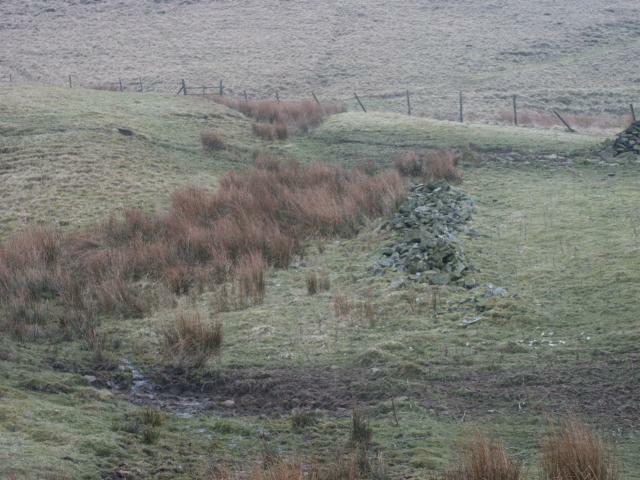 The causeway splits, this is one of the possible termination points, it is difficult to access the date of this walling, which at some point would have sealed this entrance. This entrance cuts straight into the main rampart of the fort, it is a ditch, about a meter wide, and .6-1m deep. This is a poor photograph. It shows the entrance from outside the fort, standing in the causeway ditch. 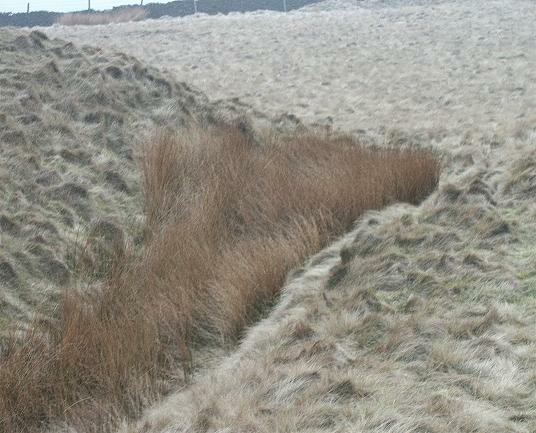 In the center of the photograph the brown tufts of reeds show the beginning of the entrance ditch, between the cut through the outer rampart. The ditch forgers a path between the two ramparts – perhaps twenty meters. Close up of the outer rampart and entrance ditch. Outer rampart intersection with the entrance. 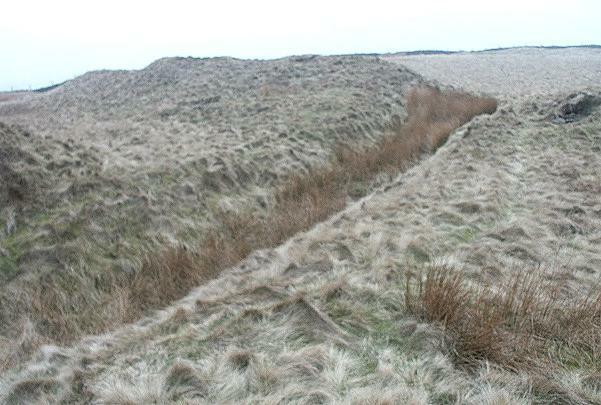 This takes the form of a ditch – echoing the ditch of Ditched Entrance 2. However, this ditch is much longer. 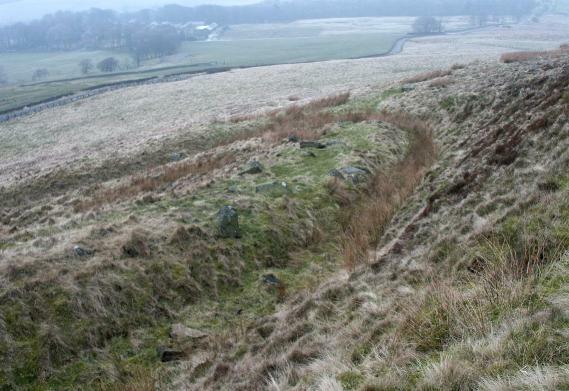 View from the north eastern corner of Castle Naze, the Ditched Entrance 3 can be seen dropping down the slope towards the east, then turning almost back on itself to travel away to the west. The ditch leaves the north eastern corner and descends the northern slope of the hill traveling in a straight line for 60-80m in a westerly direction and then it turns almost 360 degrees back on itself to continue down the hill, but in a westerly direction. It travels for over 100m, potentially splitting at one point, then terminating in a very disorganized area of clear natural and man-made intrusions. 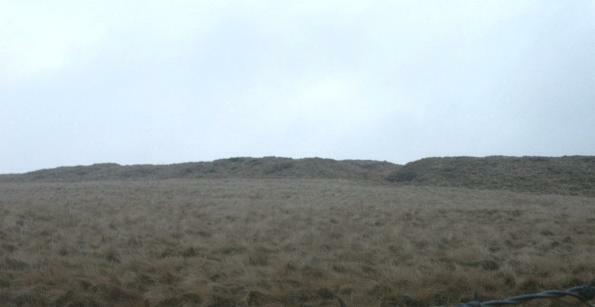 View from the western corner of the ditch, it travels beyond the field wall for a similar distance. The area beyond the wall. 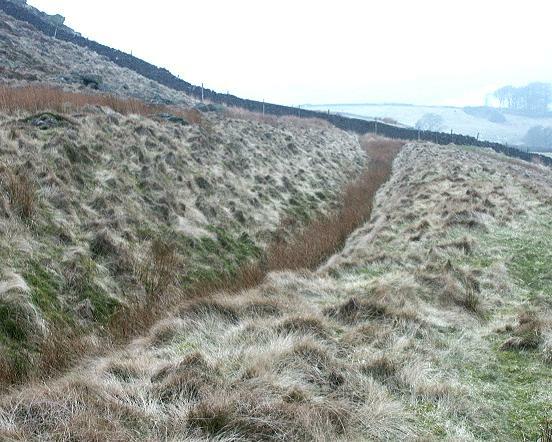 An extended view beyond the wall, the ditch appears to split here, but it may be the result of an interface with a stream, notice however, the western arm continues traveling slightly uphill, until it meets a heavily interrupted area, part of which is shown below. 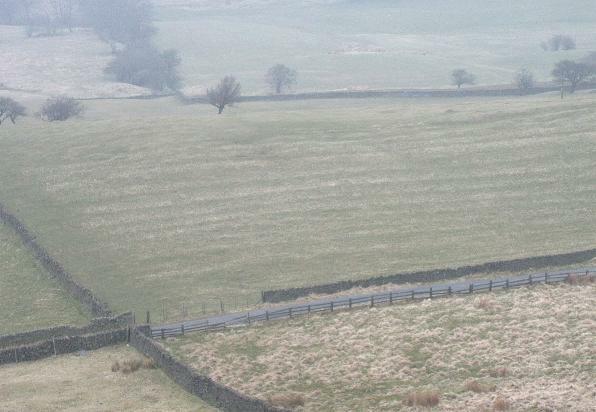 This may be a trick of crop spreading, but a possible field system exists immediately to the North of Castle Naze. 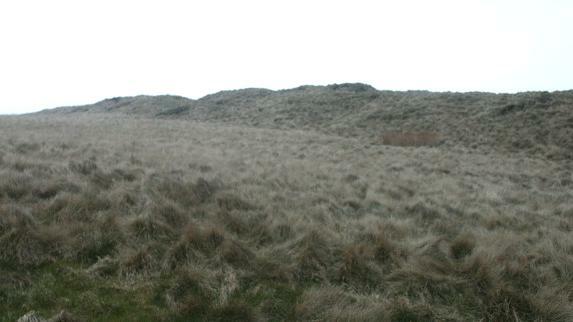 Towards the north east, a number of tumuli indicated further human activities. 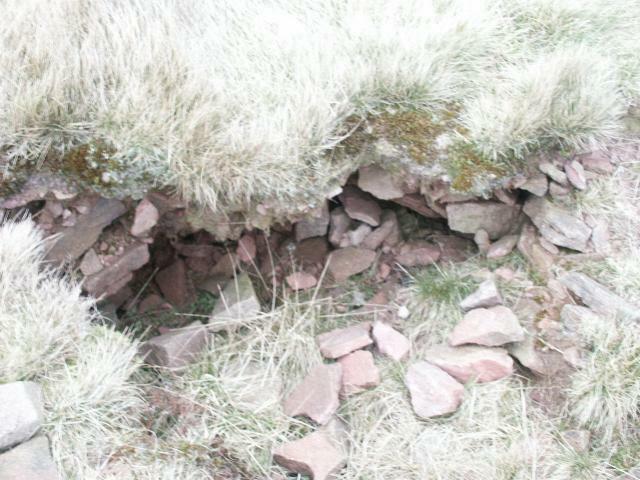 In his guide, Nicholas Thomas indicates the ditched entrance (2) was perhaps not an original feature. This is a reasonable initial conclusion, since ditched entrances are not known features of hill forts. The appearance of the ditch in entrance 2 – the only ditched entrance he mentions, is that it cuts straight through the rampart, and would seem to post date the construction of the rampart. However, that does not mean that this entrance is not worthy of interest, it is highly unique, and certainly has a relationship with the construction of the fort – it begins at the outer rampart and ends at the inner. The existence of the second ditched entrance (3) seemingly un-noticed by Thomas, confirms that these entrances were deliberate features, specifically constructed with the fort in mind. So far, I have called these features “ditched entrances”, however their precise use at this point can only be conjected, they are features which certainly allow something to enter the fort, but their size and manner of construction tends to widen the possible purpose beyond simply an entrance for those dwelling within the fort. It is possible that these features were constructed long after the fort was abandoned, as happens often with hill forts. 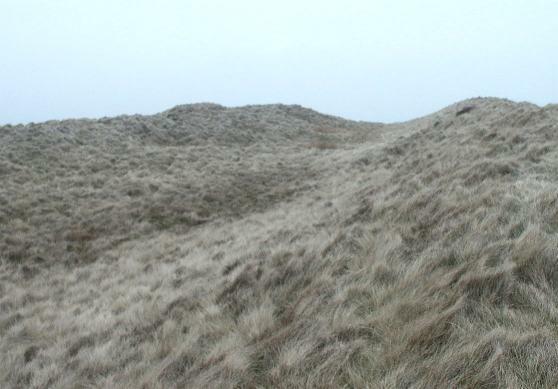 However, other interpretations could apply, for one thing, a number of forts or enclosures have been identified with unusual entrances – Maiden Castle, Reeth, for example. 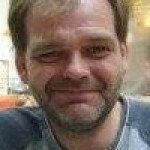 It may be that such features where a feature of a well developed and widespread tribal center, whose defensive functions are no longer the reason for use, rather the ceremony of the day. A further, less likely purpose could be a use as a possible siege-works, Caesar mentions in “Gallic Wars” that some Celts from mining backgrounds used tunneling to penetrate the interior of a hill fort, could this be a variation on that theme? The attempt to wall up the causewayed entrance – 1 may have been a defensive measure.